For many people driving quickly down South Trade Street, they may have seen or glanced at the nearly eight-foot metal heart sculpture off the sidewalk at the front of Stumptown Park. Known as “PDA or Public Display of Affection,” the piece was loaned to the town in 2013 by philanthropist, skateboarder, and sculptor, Tom Risser. Should someone choose to buy it, the price is $5000. “I’ve been placing little heart-symbols in my work for 15 years,” said Risser. This message was amplified nearly three years ago when he suffered a massive heart attack and had quintuple by-pass surgery. “I always put heart in my art,” he said. 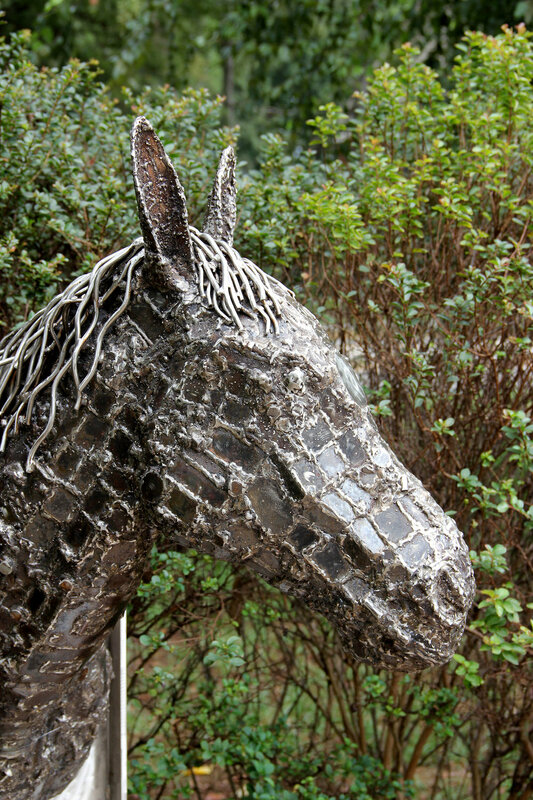 Risser’s other artistic contribution to Matthews is the small horse sculpture in the town’s pocket park located on Old 51 near Town Hall – a memorial to Kay Plyler, a deceased town employee.